Now available from L3 Narda-MITEQ are the company's redundant SATCOM LNA Plate Assemblies which strengthen signal integrity from L- to Ka-band. 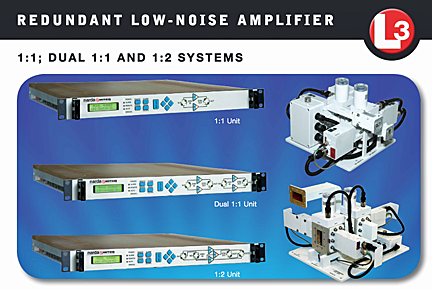 The 1:1, dual 1:1 and 1:2 redundant low-noise amplifier (LNA) systems are designed to ensure continuous operation without disruption of signal transmission. The LNA portion of critical, high value SATCOM links can be protected and link continuity insured through the use of L3 Narda-MITEQ's extensive series of 1:1, Dual 1:1, and 1:2 Redundant LNA Systems. The redundant systems are comprised of a weatherproof antenna mount plate assembly containing two independent high performance LNAs plus switches and interfaced over standard RS422/485 communications to the remote indoor, rack-mount controller which can be located up to 100 feet (30m) away in the standard configuration or up to 400 feet (122m) in custom versions. The controller remotely monitors the LNA signal and automatically switches the standby LNA into the SATCOM link and removes the fault unit instantly maintaining link continuity. 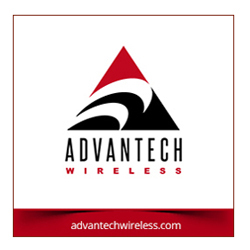 All SATCOM bands are available, L- through Ka-, as well as many additional options including 10/100Base-T Ethernet control.